2010. 208 pages. 7 x 10 inches. Softcover. At times introspective, humorous, and resolute, but always revealing and engaging,Lists is a unique firsthand account of American cultural history that augments the personal biographies of some of the most celebrated and revered artists of the last two centuries. 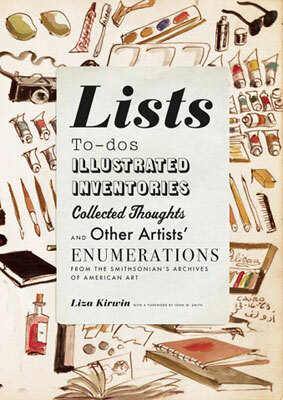 Many of the lists are historically important, throwing a flood of light on a moment, movement, or event; others are private, providing an intimate view of an artist’s personal life: Pablo Picasso itemized his recommendations for the Armory Show in 1912; architect Eero Saarinen enumerated the good qualities of the thenNew York Times art editor and critic Aline Bernstein, his second wife; sculptor Alexander Calder’s address book reveals the who’s who of the Parisian avant-garde in the early twentieth century. In the hands of their creators, these artifacts become works of art in and of themselves. Lists includes rarely seen specimens by Vito Acconci, Leo Castelli, Joseph Cornell, Hans Hofmann, Franz Kline, Willem de Kooning, Lee Krasner, Reginald Marsh, H. L. Mencken, Pablo Picasso, Ad Reinhardt, Eero Saarinen, Robert Smithson, and N. C. Wyeth.